Part of the Fewtrell empire of clubs and venues, Rebecca’s was located on Severn Street in the city centre, off John Bright St. It later became Boogies. Spread over three floors, the rooms were called The Cabasa which was more of a cabaret room, then there was the Blue Soul room and the Sin Bin, down in the basement. 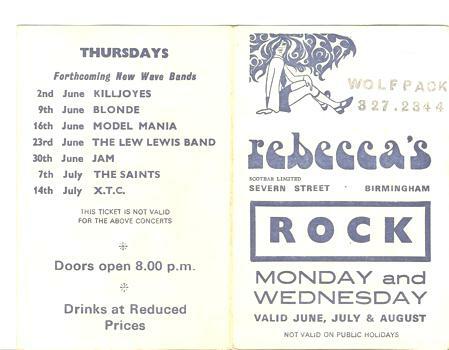 As the flyer shows, in 1977 Rebecca’s were beginning to host what were then termed New Wave Bands, but are what we would now consider Punk bands (or certainly lumped in with them). Great to see a Killjoys gig (note the spelling). But what a line up in June! Killjoys, Blondie, Saints, XTC and the Jam. What is noticeable though is that Rebecca’s were still putting on local legendary bands like Jameson Reid and Ricky Cool and the Icebergs at the same time. Punks and Rockers, sworn enemies frequenting the same venue! I think it was primarily a reggae club with punk nights so there were always rastas and the air was thick with ganja. 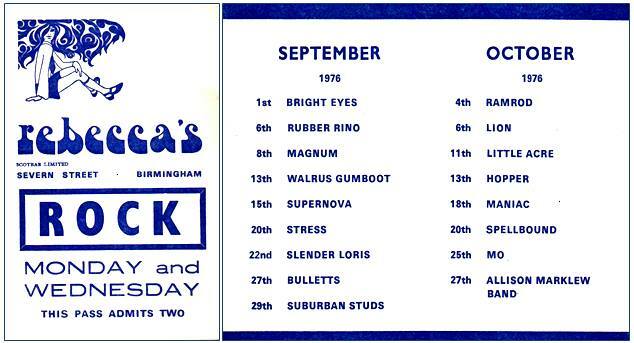 I remember seeing Ultravox and Generation X.
I used to be a regular at Rebecca’s for a few months in late 1970 / early 1971 when I lived in Brum. 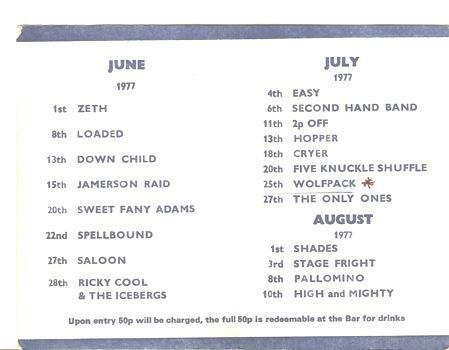 I remember seeing Johnny Johnson and the Bandwagon there in the basement – loved it. A great club ! I saw the Police in ’77 at Rebecca’s. I used to go with a guitar player pal but that night was on my own. Sting was wearing his army/air force jump suit, Copeland was on kit but another guitarist, not Summers was with the band. 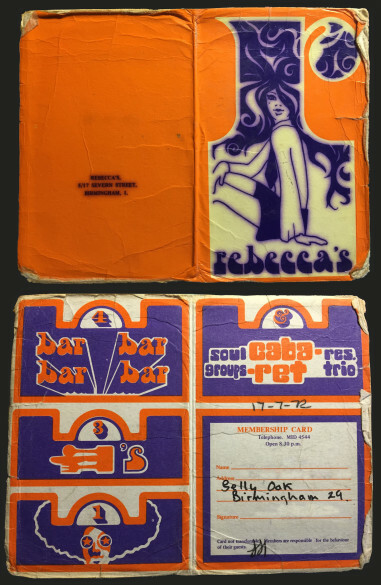 I’m working on a doco about the group and wonder if you – or anyone you know – kept any memorabilia from the Rebecca’s club / gig? ie flyers, photos…. 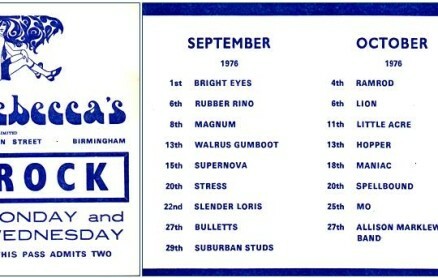 I went to Rebeccas a few times late 75 – early 76. Saturday nights on the top floor. Soul/disco music with a slowie section towards the end and a 2am finish. I’m working on a doco about the Police and am seeking good scans of any flyers, photos, tape recordings…from the Rebecca’s gigs (they played in early ’77 before Andy Summers joined – but their first ever gig with the classic Sting-Summers-Copeland lineup was also at this venue in August ’77). I saw David Bowie there on a Sunday night not long after his Space oddity hit. He did a acoustic set which included The port of Amsterdam ,not more than sixty there brilliant night. I saw David Bowie that night, I tell my 3 daughters about it and they can hardly believe that we were a very small audience and just sat on the floor while he played his guitar and sang. He was only just starting out and I don’t know if we would have believed how big he would become. What a memory. I remember he had curly hair then, am I right? I used to be a semi-regular to the punk/New wave bands that they put on at Rebecca’s. I saw, among others, XTC, Siouxsie & the Banshees, The Killjoys, Penetration, Model Mania & Ricky Cool among many others. A great venue over 3 floors.